With full-color tags, an updated look and brand new recipes, these books are guaranteed to be just as pleasing as our best-selling Classic Editions have been for years. Collect all four brand new titles and create homemade gifts to delight your family and friends! 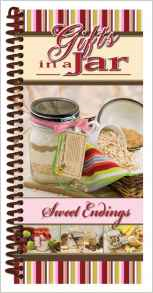 Recipes in Sweet Endings include: Caramel Rum Fondue, Chocolate Cherry Bark Candy, Deluxe Chocolate Chunk Cookies, Peanut-Cashew Clusters, and many more! Size: 4 1/2 x 9 1/2 inches, 60 full-color pages with Burgundy plastic coil binding.